There are a lot of things one could wish for and I think that most any teacher wishes their classroom was slightly different. 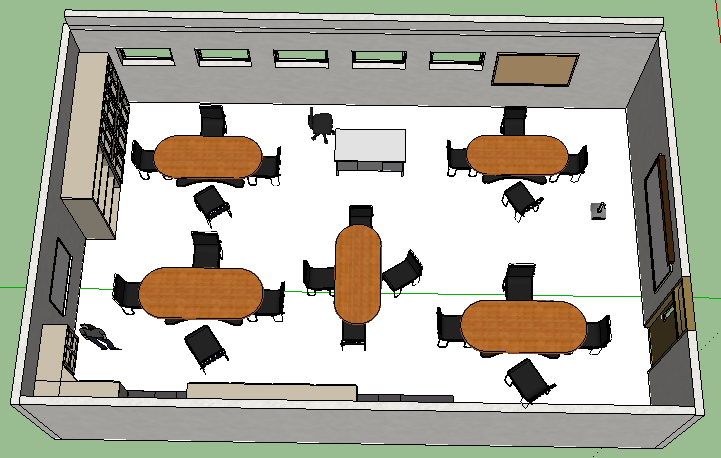 This week in my CEP 811 class, we were asked to create the ideal learning space for our students. I currently work in a fairly dilapidated but certainly functional classroom. The room shows many signs of wear, with patched walls that haven’t been painted, old carpeting, graffiti laden tables, and a hodgepodge of chairs in various states of disrepair. Beyond that, the classroom does have the conveniences of plugs in the floor for our students’ laptops, a SmartBoard, and is fairly spacious with good windows. There is also ample board space and wall space for posters. 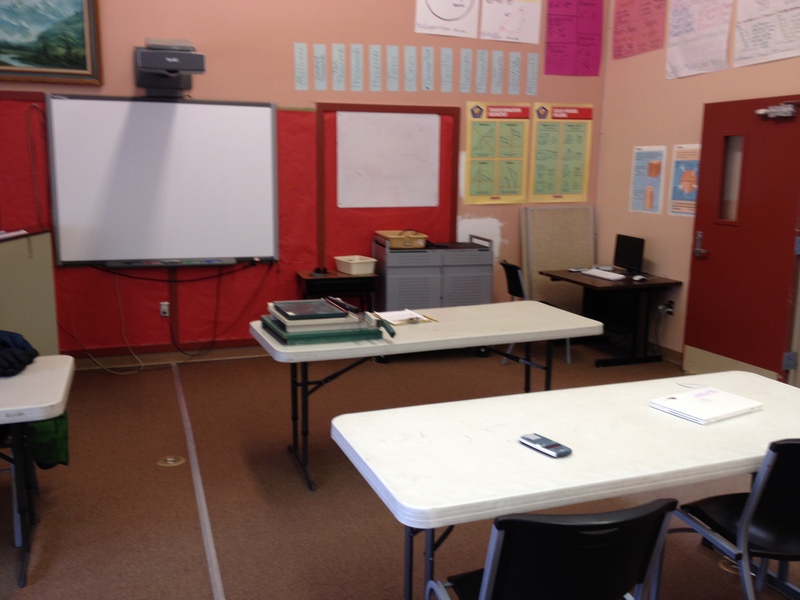 A more simply resolved issue is the teacher centric layout of the room. My desk is at the front of the classroom, all the students tables face forward and most days consist of a lesson on the SmartBoard, delivered by myself. The changes that I would like to make in my classroom deal specifically with the deficits described above. I would like to move the teacher’s desk to the side of the room, as displayed below. This desk arrangement gives me closer proximity to students allowing for easier and more effective helping and monitoring. Taking the desk away from the head of the classroom begins to breakdown some of the barrier created by the authority figure in the room. 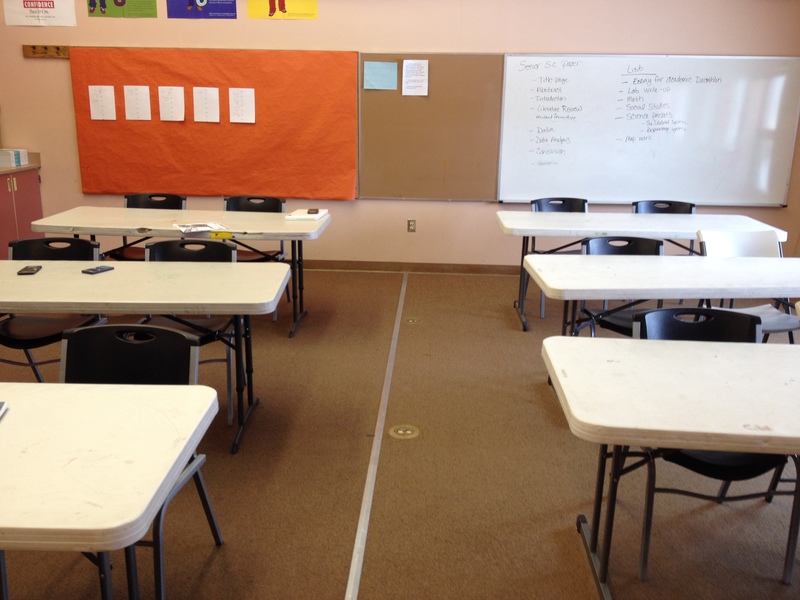 The rounded tables with 4 at a table would aid in students being able to see for lessons, while also capable of easily re-arranging for group work. I would also like new or at least nice looking tables, chairs, room decor, and calculators. Not that students can’t be successful with the tools and the room the way it currently is, but I believe a strong message is being sent to students through the use of degrading and poor quality products in the room; specifically that they’re not important enough to have better things. To make these changes happen involves two things. The first being the small amount of time it would take for the classroom to be rearranged. 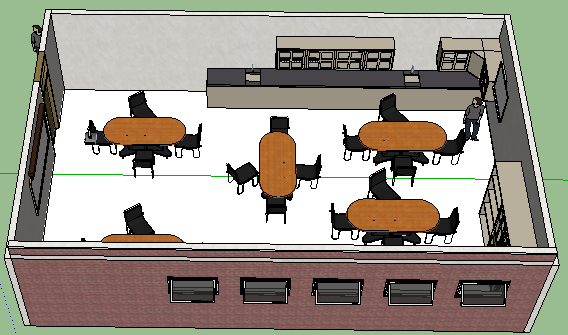 The second would either be funding or donations of new equipment (tables, chairs, carpet, etc.). Although the most direct stakeholders in this situation are the students, their parents, and the school staff. I believe that the entire community holds some stake in the situation, especially because the town is only about 600 people with 1 high school and 1 elementary school. It’s exciting to know that improving my learning space, in part, can be done for free. However, the funding for the other materials seems a bit daunting if these will be new supplies, especially when shipping to rural Alaska is considered. Decent chairs are going to cost around $30 and I would need about 20 plus a few extra, so chairs would cost about $700. The tables could be purchased for around $100 each; 5 tables would cost $500. A new set of calculators will be $300. Carpeting and paint would likely come to another $300. All materials totaling $1,800 dollars plus shipping, often about 30% of the total being shipped, an additional $540. That is a daunting sum. However it could be offset with donations and fundraising. The implementation of this entire design could happen in a weekend. Moving the desks could be done starting anytime, although shifting classroom environments during the school year will affect productivity negatively initially as students get used to the new design. The purchases and installment would likely have to take place during one of the larger school breaks. As an educator, I’m always looking for ways to help student learning and engagement. At times, I feel completely overwhelmed by the whole educational process and it’s nice to have classes that help you focus on different aspects of teaching in order to improve the parts, rather then trying to figure how to improve everything at once.